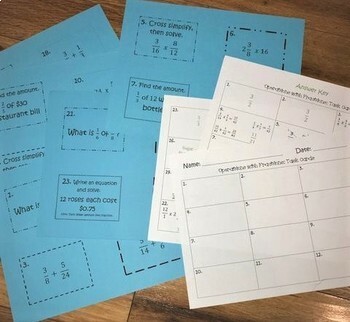 Fractions can be challenging... make them more engaging while using these task cards. This product includes 24 task cards which include concepts such as multiplying, cross simplifying, adding, and subtracting fractions! Answer sheet and key are included! Use these task cards as a Scoot Review, math centers, or place them around the room for your students to walk around and answer. This is a great tool to assess understanding of operations with fractions.